Well, I'm finally back in the darkroom and enjoying once more the smell of fixer in the morning. Actually, I don't mind the pong but I think the family might if I let it get out of hand so some odourless fixer is on the shopping list. I can't say it's been too easy if I'm being honest. Phil Rogers says it's like riding a bike but, for me, it's more like trying to dredge from the recesses of my memory those Latin passages I once knew verbatim when I was 16 and which I could regurgitate under exam conditions. Not that printing is like an exam - more of a test, I reckon. It's not the actual process so much that has to be re-learned but more the "workflow" that encompasses the whole experience. Having everything to hand and knowing where it all is, such as pencil, grain focuser, dodging/burning tools, multigrade filters and scissors, for example. Until I'd had a couple of darkroom sessions, I had to stop and think where all this stuff was and that interrupts the workflow. The other thing I'll need to attend to and pretty quickly is the electrics. If you cast your mind back to the darkroom I have you'll maybe remember it was once one big, long room I split in two courtesy of a partition wall. Well, I haven't yet got round to splitting the electrics in two so if someone enters the half of the room that isn't the darkroom and switches on the main light, it switches on the ceiling light in the darkroom as well. This could be fatal, obviously. Not for me but for any packets of paper that might be lying open. I'll need to find a way of disconnecting my ceiling light and rewiring it so the only on-off switch is in the darkroom. Here's another gripe: too many enlargers. How can one have too many enlargers I hear you ask. It's the darkroom equivalent of having too many cameras/formats. One of the things I've found through having too much gear is that the regular chopping and changing stops me becoming really familiar with the workings of a particular outfit. Just as I'm getting to know it and everything is becoming instinctive, I feel the urge to switch formats. Maybe if I had just two outfits this wouldn't be so much of a problem but it's not that easy achieving a high degree of familiarity with lots of different bits of equipment. At least not for me. I've been experiencing the same thing in the darkroom although it's clearly early days. I've got four enlargers in there and although you might not think there's all that much difference between enlargers, there is for me. My first session was spent with the Philips PCS 150, an enlarger with a dichro colour head that makes changing paper grades a doddle and which requires no exposure compensation when switching from one grade to another. It achieves this by adding neutral density light, for want of a better description, to the light path to balance out the differences between grades. This is all well and good but I found it made for very long exposure times. I used one of these enlargers in my early 20s and I can' t remember this being an issue before. Then it occurred to me that I probably had the condenser light source rather than the colour one back then. With a 75w or 100w bulb exposure times would have been much the same as any other similar enlarger. And how long were these lengthy exposure times? Ridiculously long I'd say. How about 80 seconds at grade 0 wide open at f4.5 on the 50mm Focotar? For a 6x9 inch print. Well, that was the first exposure for that particular print. I was split-grading so it was followed by another 13.5 second exposure at grade 5. I found it hard to believe as well. So, I think, did Phil who said the "nuclear flash" from his Devere would have blitzed the paper in a few seconds. The first negative for this first session was my Leica shot of the bins that proved popular with readers. It looked a nice, straightforward neg. No sky, no awkward burning in. Just find the right exposure and paper grade and away we go. It's a Tmax 400 neg developed in Rollei RHS/ Firstcall/AM 74 developer. OK, it might look a tiny bit dense in the highlights but it wasn't something that was too noticeable to me when I looked at it on a lightbox. It was when I tried to print it, though. My first grade 2 test strip, a wide-ranging 10-40 seconds at f8, told me absolutely nothing beyond the fact that it was hopelessly under-exposed. Another followed at f4.5 and it appeared as if an exposure of around 25 seconds would be needed. I'd decided to give the Ilford split grading method a go which basically involves dividing the grade 2 time in two and giving two exposures at grade 0 and grade 5. The idea then is that you carefully examine the highlights and shadows. If the highlights are too light then you increase the grade 0 exposure or decrease it if they're too dark. Weak shadows are sorted by an increase in the grade 5 exposure and vice-versa. 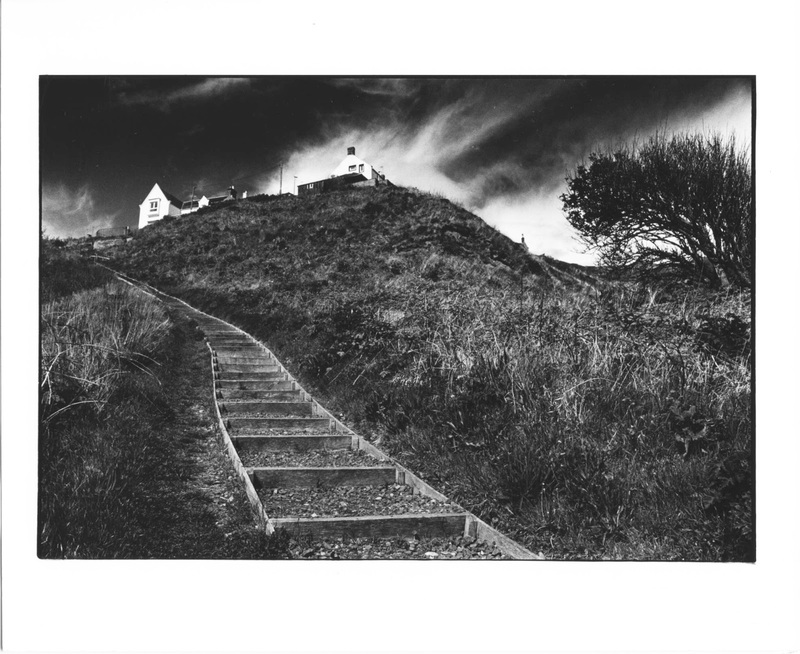 A test print showed that the left hand side of the print would need a lot more exposure than the 12 or 13 seconds used for the split grade and I eventually ended up with the 80s grade 0 exposure talked of earlier. The resultant work print isn't bad but the right-hand, shadowed side of the wall could do with a little dodging. Next up was an OM2 shot of a bit of stonework in a Fife country cemetery. 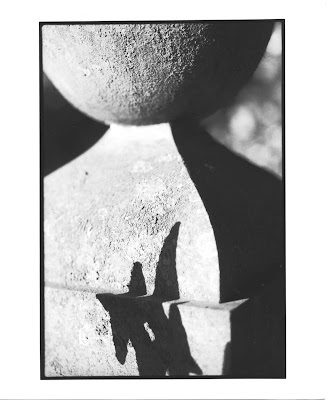 This was made using the 50mm f2 Zuiko and Adox Silvermax developed in Spur's HRX. There were no real problems with this neg other than another lengthy exposure time. 70s at grade 0 and 30s at grade 5. It's a nice print and has the graphic look I was after. So that was the first darkroom session out of the way. Next up was the Valoy II with the same 50mm Focotar. Speak about chalk and cheese. From 80s at f4.5 to 5s at f 11! There's nothing to identify the Valoy's lamp but I think it must be a 150w judging by the brightness. It's too bright in fact as I'd rather be using f5.6 or f8 for optimum quality. 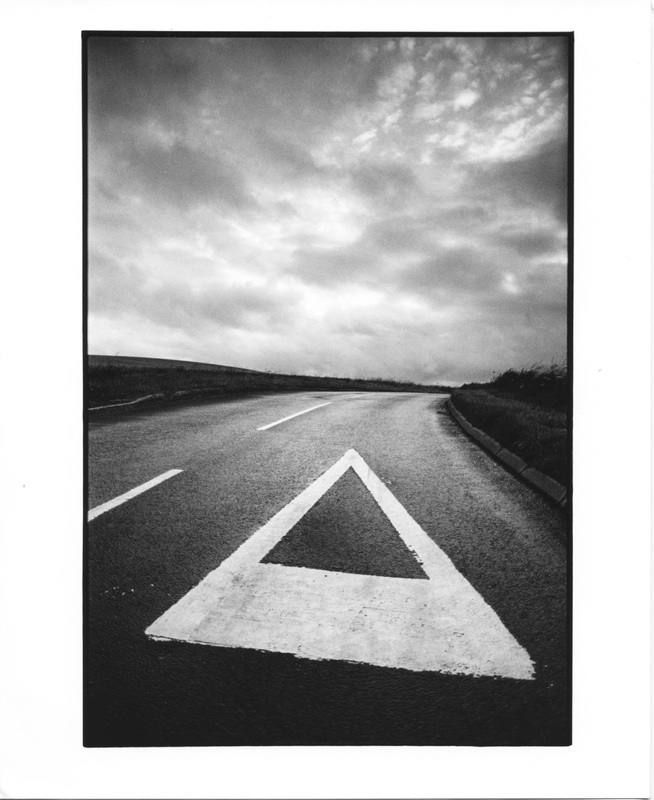 The road sign shot, which I somewhat pretentiously call Delta Sky, has featured on the blog before as have the others. There's not a lot I can do about that until I get round to developing the five or six films waiting patiently for attention. It was taken on the OM2 with a 24mm Zuiko. The film was Adox Silvermax and the developer Spur's HRX. There's no split grading this time not because there's anything wrong with it but because I haven't yet fashioned a holder for below the lens multigrade filters and have to pop them on top of the condenser. Lifting the lid off the lamp housing to swap filters is likely to cause a shift in focus or nudge the negative slightly out of position - or maybe not as I haven't bothered to test it. This was a nice, easy print with a 7s basic exposure at f11, an extra 7s to the top right to balance up the sky and then a 20s burn in of the sky. After being a bit like a fish out of water during the first session, I'm now starting to feel comfortable again in the darkroom and I'm determined to print regularly to keep my hand in. Finally, there's Auchmithie Steps. I used a Contax 137MA and 28mm Distagon for this shot, exposing some Silvermax and developing the film in Spur's Acurol-N. The print got just 5s at grade 2 and wasn't too bad as far as footering goes. The sky got an additional 3s, the bright sky to the left of the small tree an extra 7s and the edges just a second or so all round. As I said earlier, these are work prints and all apart from the Fife cemetery shot could do with some improvement. 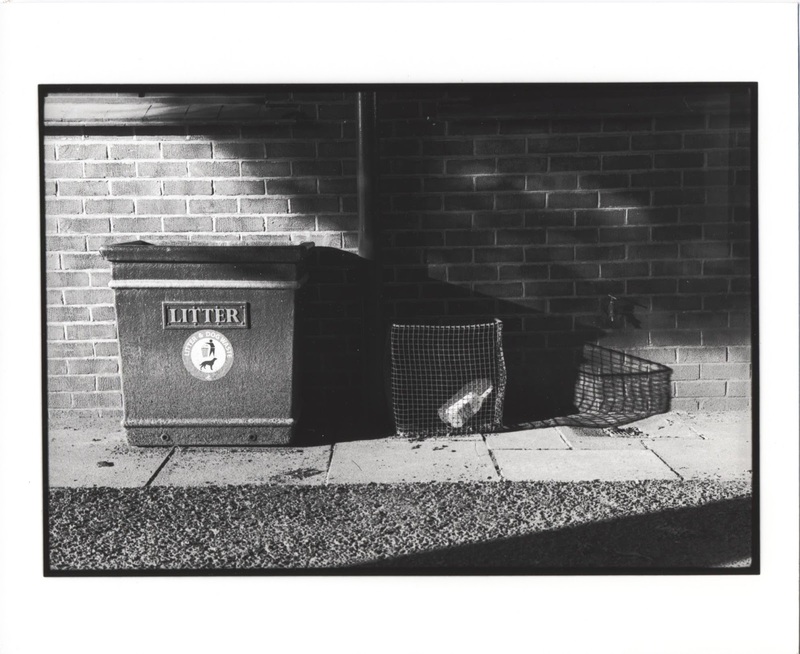 The bins would benefit from a lightening of the shadowed area above them and getting rid of the small bright triangle of light on the bottom right corner. Auchmithie Steps was deliberately printed quite dark as I wanted the steps to be lighter than the surrounding ground to make them stand out. I think I overdid it a little and would probably print it a bit lighter. The bright sky next to the bush/tree also needs further darkening as it's draws the eye away from the houses at the top of the hill. Delta Sky is almost there but I'd like to print the sky darker to see if I can add some extra drama to the scene. These thoughts might change over the next week or so as I study the prints from time to time. But it's good to be back following through the entire film process from clicking the shutter to flattening the prints under a pile of books. Great post and a lovely set of prints to boot! Thanks Marty. Glad you liked them. Yeah, these are good prints Bruce, so well done and welcome back to the world of smelly fingers! Can I say one thing though, rather than using a fair bit of paper with 'plsit-rdgae' (watch Monty Python's Confuse A Cat - you can end up confusing them photons if you're not careful) why not print at a set Grade (maybe a 3 or 3.5 with MG paper) and utilise your marvellous massive sink and adjust those highlights with a bit of selective Pot-Ferry bleaching. It works and now you can do it in comfort - just rig a directional hose-nose up to your tap. Just a thought. Anyway, can't wait to see more - 'tis good to have you back properly as it were! Not too shabby for an unfamiliar darkroom. In my view the most important darkroom skill is looking at the prints and deciding what to do next, but you seem to have mastered that already. Sooner or later, the scissors and sellotape will shuffle themselves into the right places. A suggestion for the lighting. Take out the ceiling bulb. Get yourself a cheap uplighter and plug it into a socket. Get one with a foot switch, for safety. Bingo. A nice soft overall light and no interference from the outside world. I found that an extra light over the fix was helpful, but it needs to be the right brightness; too bright and you print darker to compensate and conversely, too dim and the reverse. You might arrange for it to switch on with the uplighter. A bit of screwdriver work shouldn't scare a chap who knows what happens in the private bits of motor cars..
Motor cars? You're confusing me with someone who has an employable skill. I can wash them and that's about it. Haha. I'd thought about wiring in two ceiling lights, a safelight and a normal room light, and running the cable to a double light switch. What are the chances of switching on the wrong one by accident, though? Pretty high I'd imagine. How about as a temporary fix a red safelight bulb in the main socket and a couple of battery LED under kitchen unit lights over the inspection areas. You can use rechargeable batteries - they work fine. Welcome back to the world of darkness. Great prints by the way especially as your in an unfamiliar working environment. I have just received the SP 445 tank from the states by the way, you may remember I emailed you earlier asking if you used one. They have changed the holders slightly, mostly there were some issues with the solid plastic holders and the ribs which were there to stop the film adhering to the holder. This left lines on the neg, well at least for some users but strangely not all. So they have taken the middle out of the holders. I must say they are easy to load although the plastic is a little flimsy. I did my first 4 sheets in the tank yesterday and all went ok. No marks on the negs. I haven't had time to examine them in detail so I will let you know. All in all a good product, although the SP445 was expensive due to shipping cost from the states, around 23 dollars, but even that was beaten by the UK import duty and Royal Mail handling fee of £24!! That took the shine off it but I have recovered from the wallet shock now. I have, as an extra bit of light over my trays, installed one of those LED bulbs which are operated via a remote control pad. You can change the colour with the pad and increase or decrease the strength. I use it at its lowest level obviously on red then when I need to perform other tasks switch it to white. I have conducted safelight tests and all ok although obviously this would be dependant on the location of the lamp with resect to the trays. Best £8 I spent at B&M store. Great prints! I'm curious about how you managed to include that thin black border, is that just flashing the edge with a holder over the print or something more exotic? I do envy the dual enlarger setup, for lack of space I switch the condensers between the 35mm and 6x6 setup on my Durst M601. Dual enlargers seems a more elegant and effective solution. The border is just a couple of mm of rebate around the actual image. My negative carriers measure about 39mm x 27mm - just enough to let a little bit of blank film squeeze in. One thing for sure: I like all of the first shots. The traditional way to rig a safelight switch is to have a horizontal string above the wet bench, attached to a click-on-click-off bathroom light-pull at one end. The main light switch is left where you'd expect, on the wall, with a little luminous sticker if you need it. You may have a better idea – "Hey Siri, switch on the main light." You operate the safelight in the same way that bus conductors used to operate the bell, when there were proper buses and proper conductors. And before we were forced to adopt the Euro, too. Just you wait. This doesn't quite solve your problem of someone entering the Library and helping you to make solarised prints or negs. Perhaps, for the moment, a little hook on the wall and a red cloth draped over the entire Library light switch when you are In Residence. Hi David - how I miss those old bus pulls . . I suppose you'll be telling me next that the old spirally/dangly hand-holds on Tubes have gone too? I actually rigged a small waterproof in-line switch on my safelight's cable twixt plug and light - the sort they use for bedside lamps and such like, except water-protected. Works great! Quaint ideas, chaps. Very last century. I'm thinking of sound activated lights. Just a couple of claps for on and off. How can anything go wrong? I've got a Philips PCS 150 and I've never been near a 80 second exposure... probably 40 seconds at most. Are all three of your lamps working? I use the PCS 150 for 35mm and 6x6. I was lucky enough to pick up a set of 6x6 condensers and a 120 film holder, although I could really do with some glass inserts for it as the 120 negs do curl more. Welcome back to printing, Bruce. A well printed set of pictures.